Lexington, Kentucky is the perfect location to sell a home. Selling a home in Lexington is varied because of its cosmopolitan, yet naturally rural landscape. Lexington neighborhood homes include condominiums, townhomes, single family dwellings, farms, cottages, and lofts. Real estate brokers and agents can help homeowners command a good deal for their home, but a perfectly staged home actually completes the sale. Renovating a Lexington home for sale means competing against other similar homes and appearance is a critical factor in getting the best price. The more a seller can do to make their home appealing, the better chances they have of a fast and sure sale. Buyers are looking for houses that don’t require a lot of work or costly updates. There are easy kitchen renovations that will help sell your home in Lexington. Old dull paint, grease stains, and stuck on food splatters can make a kitchen appear unattended and less attractive to a buyer. Repainting the kitchen is a cost effective and simple DIY weekend project. The paint manufacturing industry have developed paints with built-in primers that can cover many hard to cover blemishes. Touching up the kitchen with a fresh coat of paint helps to make it look clean and smell fresh. 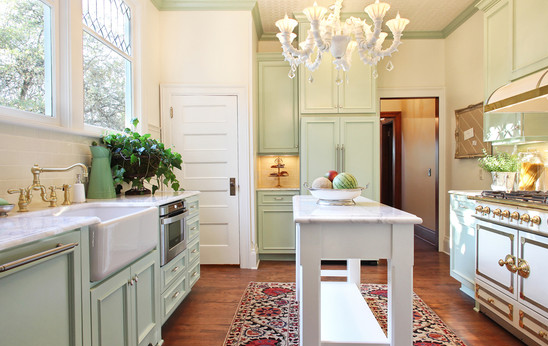 Old cabinets automatically give an unattractive look to a kitchen, simply because cabinets are a kitchen’s focal point. To save money, use the new technology of cabinet transformation refinishing kits, instead of re-facing or replacing cabinets. With a cabinet transformation system, there is no stripping, sanding, priming, or a contracting mess, plus its refinishing results provide a successful selling point. Another inexpensive quick cabinet fix is the purchase of a pre-manufactured modular cabinet system. Just by replacing and updating its hinges, drawers, and door knobs with colorful designs also adds an eye appealing feature. The same type of home improvement refinishing kits are available for worn or damaged counter tops. Counter top technology offers many decorative options, by providing tiles that are made to look like stone, granite, and wood. These home improvement techniques are a great benefit in selling a home. Additional renovation tips for renovating a Lexington kitchen is to change the kitchen floors with individual tile pieces that are self adhesive. Also, by increasing the lighting in the kitchen, everything will appear brighter and fresher. If your sink needs a renovation, then replace the faucets and self clean the sink itself, especially if it is an aluminum sink. There are many products on Lexington store shelves and at home improvement companies, which offer repair or renovation kits. The Lexington community encourages the growth of local businesses, therefore finding a home improvement store or hardware store is easy as walking through any of the many varied neighborhoods. Selling a home in Lexington, with these minor renovation tips, almost sells itself because of the big city amenities that rural Lexington offers buyers and sellers. To learn more about selling your home, feel free to contact us and we’d be happy to answer any of your questions!